(1) DNA fragments are loaded into the gel. (2) Electric current is turned on, pulling the negatively charged DNA toward the positive electrode. (3) Smaller DNA fragments move faster through the gel. (4) The DNA is stained, revealing its position. centration of acrylamide and bisacrylamide in the gel. Increasing the concentration results in more crosslinking between the two components, decreasing the pore size. Decreasing the concentration increases the pore size of the gel. Small proteins are separated better in a gel with large pores. (1) A protein mixture is first separated by pH. (2) All proteins are made negative by the addition of a detergent, and are separated by size. (3) The final gel is stained to reveal the position of hundreds of unique proteins. 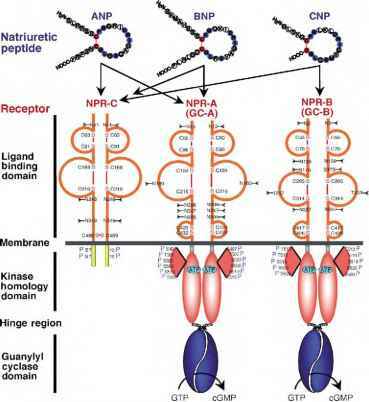 proteins enter the top gel, where they are maintained by in a tight zone between ions generated by the electric field. This is accomplished by having ions that run both slower and faster than the negatively charged proteins, so that ions sandwich the proteins between them, tightening the protein band. The proteins leave the stacking gel and enter the separating gel. In this gel the ions no longer sandwich the proteins because of a change in pH, and the pore size is smaller so that the proteins separate by size. Isoelectric Focusing. Researchers can use gels to determine a protein's "isoelectric point," or the pH at which the protein's net charge is zero. Because pH changes the ionization state of several amino acid groups, the net charge on a protein is pH-dependent. By running proteins through a gel that has a pH gradient from one end to the other, this charge is gradually changed. At a certain pH, each protein's net charge will become zero, and the protein will stop moving. This procedure is known as "isoelectric focusing." 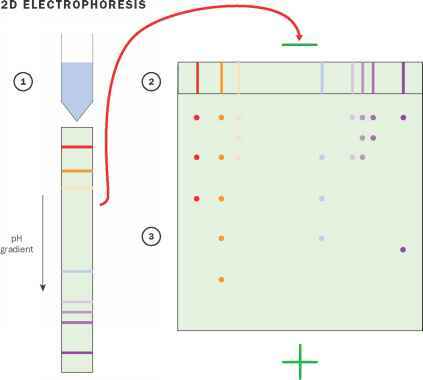 Two-Dimensional Electrophoresis. In "two-dimensional electrophoresis," a mixture of proteins is first separated in an isoelectric focusing tube gel. This tube is then placed sideways on an SDS-PAGE gel. In this way, proteins are separated based on two parameters: size and isoelectric point. Com pared to techniques based on only one parameter, two-dimensional electrophoresis separates more proteins at once.